The competition is increasing with new OTT entrants. Content costs are climbing. There is rapidly increasing demand for personalized television, delivering a consistent and responsive experience anytime, anywhere, and on any device. 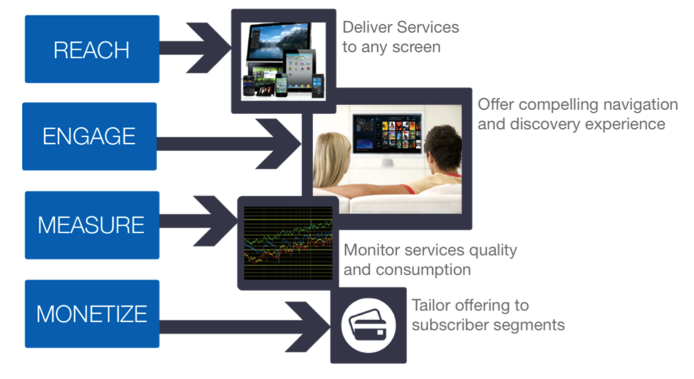 Operators are already making investments to retain existing customers while offering new types of services intended to drive broadband subscriptions and attract a new segment of OTT subscribers – essentially hedging their bets by testing variations of traditional television along with OTT services and broadband to determine which combination will deliver the highest return on investment. Moody’s Investors Service predicts cable operators are well-positioned against current OTT threats, giving them time to adapt to the changing video landscape. Moody predicts cable operators have about five years – the traditional length of the high-yield investment cycle – to come up with a solution. In order to remain competitive and create new value for customers, content owners and advertisers, facilities-based pay TV operators need to quickly evolve their service delivery platforms to better reach their subscribers, engage them with a compelling experience, and respond to their needs through improved analytics. By taking these steps, operators will be well positioned to deliver better television services enabling greater monetization and improved customer satisfaction. The time to take these steps is now. Minerva’s new service delivery platform (Minerva 10) provides an unmatched set of unique features and capabilities to enable operators to deliver next generation television services across a variety of networks and devices. With Minerva’s solutions operators can now deploy a range of Pay TV packages; from feature rich, set-top box based services like whole home DVR, personalized VOD, and network-based time-shifting, to entry-level linear TV services to consumer electronics devices – all through a single back-office.